I went for a holiday in Germany for a week last month, from the 4th until the 11th of December. It was quite cold and there was lots of snow both on the ground and falling, though fortunately it was not snowing the whole time I was there. I flew from London to Berlin, where I spent my first 3 nights. I met up with a friend, Thi, who had been living in Poland for a few months and took the train across to Berlin for the first couple of days I was there. 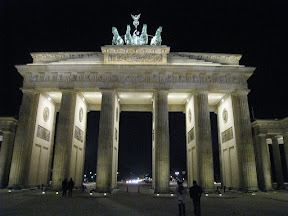 I arrived in the evening, so was not able to see all that much on the first day, but we did walk down to the east city centre (Mitte) to see the Reichstag, Brandenburger Tor, Checkpoint Charlie and a few other landmarks in the dark. On Sunday morning we had a quick look around the west city centre, but almost everything seemed to be closed. We then joined a walking tour group, on which we were shown around the Mitte area some more. Our tour guide, named Ice, grew up in Auckland but moved to Berlin some years ago. We saw part of the Berlin Wall, a number of city squares (Gendarmenmarkt and Bebelplatz), and various nice churches and other buildings. After the tour we spent about 2.5 hours wandering around the German History Museum. They had an exhibit about Hitler and the rise of the Nazi party, a bunch of statues and paintings from around Germany, and a great big exhibit all about the history of Germany over the last millennium or so, with all sorts of paintings, armour, books, furniture, tapestries, and even a pinball machine. After the museum we headed to the Christmas market at Alexanderplatz, which had been recommended to us, but not before stopping briefly at another Christmas market on the way. We spent quite a while wandering around the Christmas market, snacking on currywurst and chocolate covered banana and looking at the various ornaments, clothing and other trinkets for sale. There was a colourfully lit ice-skating rink in the middle, and a large ferris wheel at one end. We had a proper German meal at a pub nearby, which was predictably large. On Monday Thi had to catch her train home so we had a quick walk around the Tiergarten before she headed off, after failing to find some flea market. We even made a small snowman. I then headed out a bit further east than I had made it before, to Frankfurter Tor and from there wandered — with a few short U-Bahn journeys in the middle ­— around Boxhagenerplatz, the East Side Gallery (a 1.3 km section of the Berlin Wall still standing and covered in about 106 large paintings by various artists from around the world), Michaelkirchplatz, Orianienplatz, Böcklerpark, Mehringplatz, Mehringdamm and the corner of Viktoriapark, Leipzigerplatz and Potsdamerplatz (including another Christmas market, which had an artificial snow hill down which people could pay to slide on large tire tubes), and finally the area around Wittenbergplatz and Savignyplatz including yet another Christmas market. On Tuesday I spent a couple of hours at the Bode Museum, looking at their enormous collection of statues, paintings, crucifixes, carvings, coins, and so on. It was quite overwhelming, as museums sometimes are. I then caught my train to Gießen, or rather, two trains. Unfortunately the first train was slow and arrived about 30 minutes late, which meant that I missed the second train and had the slight drama of having to explain this to the lady at the ticket counter, who spoke about as much English as I speak German (or only slightly more), so as to get a replacement ticket for the next train in that direction. I got there in the end, though, and successfully found my friend Melanie who was to show me around the city. She had arranged for me to stay with some friends of hers, a flat of 11 German guys, 9 of whom were studying theology and the other 2 other subjects I cannot remember. It was an interesting flat — one floor of a small office building, converted into an enormous flat. There was certainly plenty of room for everyone, though I only ever saw perhaps half of the guys living there. We bought a few things from the supermarket and then cooked dinner for ourselves and one or two of the guys who were around, which was nice after having spent the last 3 in a hostel and eating out all the time. Cooking in someone else’s kitchen is always a slightly strange experience, especially when they are not even around at the time as was the case on the second night there. And of course the herbs and spices had German names which were not always recognisable. I taught some of the guys how to play Euchre, as 500 seemed a bit ambitious for the time we had available. On Wednesday we went to see Wilhelm Konrad Röntgen’s grave, then I went to the Mathematikum for just under an hour. It was quite cool, but I wish that I had had more than an hour to spend there and that it had not been overrun by schoolkids. I recommend it should you ever find yourself in Gießen. We then walked up a hill called Schiffenberg, and had a look at a small art gallery in what used to be a monastery at the top. On Thursday after breakfast I headed to the train station and caught my train on to Munich. My first night in Munich I wandered around the Tollwood festival Christmas Market and got a few things to eat, then wandered around a little of the city before heading to bed. On Friday I went on a walking tour, which was alright but not as interesting as the one in Berlin. We did not actually go all that far from Marienplatz where we started. I had lunch with some people from the tour, then spent the rest of the afternoon wandering around by myself. I walked through the corner of the Englischer Garten, which was nice. At the south end of the Englischer Garten a river which flows through the garden comes out from under a road, and the channel happens to be arranged in such a way as to create a standing wave. I had heard that surfers like to surf on this standing wave, and indeed even then in the middle of winter there were about 6 surfers wearing heavy wetsuits and taking turns to surf on the wave. It is quite a sight, and you can get a good view from the footpath alongside the road. There were a bunch of kids with toboggans playing on a small hill a bit further in. There was also another Christmas market in the gardens, of course. I walked back through the city in the dark. Part way back, I passed some people walking along in the opposite direction to me and carrying flaming torches. As I continued walking I passed more in more, all walking in the same direction but clumped together a bit. Occasionally someone might leave a torch behind standing in the snow, as pictured below. It was not at all clear where they were going or why. I followed them back a bit to find the end of the line, and they seemed to have come out of one of several buildings near the road. If you do have any idea what they might have been doing, do post a comment. After getting back to the hostel and grabbing some dinner nearby I did not do much else that evening. On Saturday morning I checked out of my hostel and went to the Deutsches Museum, which was really good, the highlight of my time in Munich. It is a huge museum all about science, technology and industries, with great exhibits about everything from oil mining to lasers, nanotechnology to aeronautics, atomic physics, optics, musical instruments, photography, robotics, and many many more things. I only got to see less than half of the exhibits, and some of them in a rush at that. I spent about 6 hours there, but could easily have spent at least twice that long just looking around at everything. They also have various demonstrations throughout the day, but I did not get to any. Should you ever find yourself in Munich, I highly recommend that you go. Munich — Deutsches Museum: Software guessing my mood and demographics from video in real time. It was fairly impressive. I went straight from the museum to the airport and flew back to London. I was glad to be back in my own bed, but it was an interesting week and I am glad I went. For more about my trip, have a look through the various albums of photos I have uploaded. The descriptions on the albums and photos tell a few more stories, not to mention the photos themselves. I will be heading out of Wellington sometime on 2008-12-31, to spend a couple of nights in Palmerston North with my cousins up there. I will then be going camping with my parents and brothers for a week or so, at Castlecliff (in Wanganui) and Mangaweka. It would be nice to catch up with anyone else who knows me and is around the area (in Palmerston North, perhaps). Are there any such people, who would like to catch up? If so, get in touch. I may not have much Internet access while I am away, so it would be best to contact me before I leave, or else perhaps SMS. Of course, I am all for catching up with people in Wellington too, though I have not had much luck with that so far.